Forty-five years ago, I first visited the Stephen F. Austin State University campus. My friend Frank had begun college there, and I went down for a visit. I was a senior in high school and intent on attending the University of Texas. 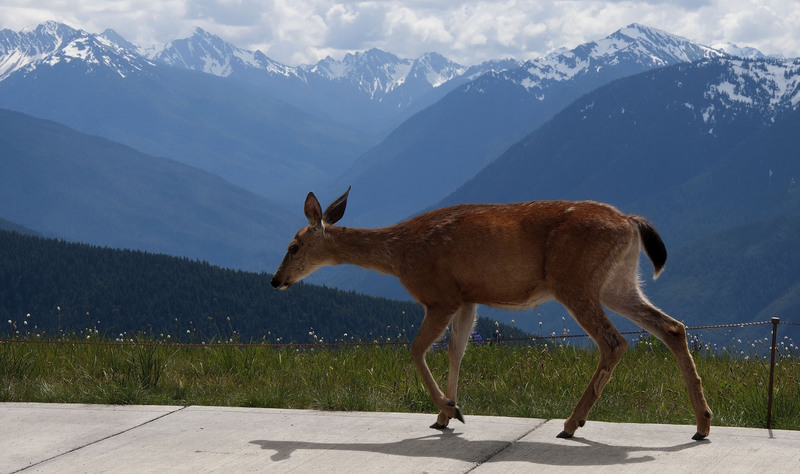 But the beauty of the campus – and the lower cost of tuition – caught my attention. I would be paying my own way through college, by both choice and necessity. After a year of night school at Kilgore College, I headed south to Nacogdoches. My SFA experience was fun and fascinating, though I often worked two jobs while squeezing in school. Since I was toting the note, with considerable help from government grants and a modest amount of loans, I took whatever courses struck my fancy. I earned a bachelor’s degree with majors in English, history and philosophy and a minor in anthropology. This prepared me well for a career as a journalist and editor since I was unqualified for honest work. I nearly went to law school at UT but backed out at the last minute. No regrets about the career choice. I ended up living in Nacogdoches a total of 18 years in two different stints, the latter as publisher of The Daily Sentinel, where I worked in college. Last week my Beautiful Mystery Companion and I were back on campus, helping daughter Abbie move into her dorm suite. My BMC also attended SFA a few years after me, but we never met. We both marveled again (we’ve been back several times) at the changes to the campus, though she was thrilled the forestry school looks unchanged. She nearly majored in forestry and loved those Lumberjacks with their flannel shirts and frayed blue jeans. The dorm where Abbie will live with three other young women has four bedrooms, two bathrooms and a common living area and kitchen. It looks like the Embassy Suites deluxe package. There are many new buildings, including a fancy student center that contains a Chic-Fil-A, much to Abbie’s delight. Much of this ambitious building program took place in the first decade of this century, which has spurred an increase in enrollment since I left 15 years ago for Lufkin. The campus is still beautiful, especially in the spring when azaleas bloom and autumn when the leaves turn color. The new buildings blend in well with the old classics, such as the Rusk and Austin buildings – the two original structures built in 1923-24. I always enjoy returning, and now we have another reason to visit. I received a fine education at SFA and fondly recall the nine years I spent teaching a night course in journalism there in the ’90s, after finally ending up at UT and getting a master’s in journalism. I’m confident Abbie will also receive a well-rounded education there as well. She is a conscientious student and already has two years under her belt at LeTourneau, so she knows what must be done to succeed. She arrived loaded up with SFA regalia – T-shirts, decals and such. Before my BMC and I left town after getting her settled in, we stopped by one of the bookstores just off campus and made our own purchases as well. 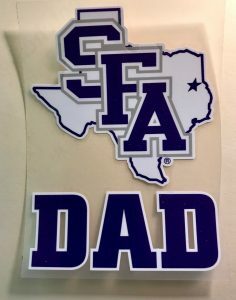 That “SFA Dad” decal is going on my car as soon as I can make it to the carwash, and I’ll wear the T-shirt sporting the same sentiment with pride. In keeping with SFA tradition, Abbie received a parking ticket her first morning there. It was really my fault, since I had parked her car in the adjoining lot after we unloaded and failed to check if it was the right lot for her permit. Besides, classes had not even begun, so it seems to me more appropriate to give a warning on the first day that housing was open. She is appealing the ticket to the Student Government Association. Hopefully her peers will grantmercy, since the parking department didn’t. Axe ’em Jacks!